This sermon was preached on November 26 at All Souls Episcopal Parish in Berkeley, CA. The readings for this sermon are: Ezekiel 34:11-16, 20-24, Psalm 100, Ephesians 1:15-23,, and Matthew 25:31-46. Five years ago, I was emerging from a season of severe illness and my partner, Jason, and I joined the Episcopal community in Bakersfield, California seeking the wholeness and healing offered in the Body of Christ. Shortly after we joined, we received a request and apprehensively uttered three letter word that would change the course of our lives. This blessed request was our Priest in Charge calling to see if Jason and I would be interested in starting a food outreach ministry and oh, perhaps serve as the youth ministers as well? We thought “what in the world is Rev. Tim thinking?” But we said “yes” and were excited to dive right in. St. Paul’s had this opportunity to develop these ministries because our diocese, San Joaquin, is one that endured a recent theological schism and the courts awarded our congregation a property in downtown Bakersfield. Now that we had a building, it was time to facilitate the ministry that our Gospel instructs us to do and we began discernment for the best way to serve our Brothers and Sisters in the community. At this time, I was building my strength to go back to work and both Jason and I had been praying for direction of where to focus my time. Prior to getting sick, I worked in politics and the oil and gas industry and knew that those seasons were over so I thought that the food outreach and youth group would be a productive way to gain my strength as I waited for God to answer my prayers. I may have been a bit dense in hearing the Holy Spirit at this time. My time in these ministries are what allowed me the opportunity to acknowledge and discern my Call to serve the Church and are what led me here to Church Divinity School of the Pacific. At St. Paul’s, we discerned that a Food Pantry CO-OP would be how our congregation could best serve “the least of these” in our community. Our CO-OP model offered a reciprocal relationship rather than one way giving and our membership was available to anyone who was willing to pay a small fee of $1, 3, or 5 into our grocery fund or work 30, 60, or 90 minutes for the CO-OP. We strived to offer a hand up rather than a hand out. We had a humble set up in the back of the stage area in our parish hall where we offered a lunch, groceries, unlimited fresh organic produce from local farmers markets, diapers and other baby items, toiletries, clothing, and household items. The food was the icebreaker for the ministry Jesus calls us to do. If members worked with us on a consistent basis then we offered to be references for their job applications, job search resources, and an interview ensemble. We worked as a congregation to get several individuals into rehab programs and did what we could to help them understand that they were valued children of God who were worth sobriety. Half of our members were unhoused and we offered resources to those seeking to get off the streets. In the CO-OP, everyone is an equal and it is a community of broken people trying to experience the wholeness of Christ together. We became a family. At times, the ministry was heartbreaking or frustrating, but the beauty, love, and joy made it all worthwhile. In 2015 this joy came crashing down when I experienced the death of a loved one, who I continue to struggle living without, and their death was partially caused by alcoholism. After nearly a month away, I returned to the CO-OP and my phone, with precious photos and videos that had yet to be uploaded, was stolen and later traced to what was a known hub for heroin addicts; never to be seen again. Almost every person in our CO-OP either struggled with addiction of some sort or was strongly affected by it and my anger, judgement, and grief boiled to a point where it prevented me from having any compassion and love for “the least of these” in my community. I excused myself from working with the people and spent all of my time on the behind the scenes logistics. Life in Christ, life in ministry, life in relationships are difficult because of human ego and sin and my ego and sin were just as much in the way as those who were blinded by the demons of addiction. Six months passed and I was deep in the anger stage of the grief cycle with self-imposed walls between me and God. One night I had a vision, and my deceased loved one came to me as a messenger to encourage me to recognize my sin and God’s Grace and refocus my energy to the work that God was calling me to do. They were fully healed and whole in Christ and I needed to allow that for myself. This vision allowed me to experience reconciliation, find peace, and to return and serve my Christian family. Today’s Gospel message teaches one of the core tenants of our faith and it presents a challenging command for the human ego. Our Ezekiel scripture conveys that human beings are naturally selfish, protective, and slow to forgive and forget in our quest for survival and prosperity. Our Gospel is difficult because living like Christ requires vulnerability to serve our collective brokenness of this world. It is hard, uncomfortable, and sometimes feels like the trenches rather than the love and fulfillment we are seeking. It is naïve to consider that our actions that are freely given out of love and generosity will always be received with the gratitude and good will that reflects our own. In our calls to serve and live as Jesus instructed, we are agreeing to live in community with those who are struggling and often cause contention. We will have our hearts broken by others, and even ourselves, when we are not capable of recognizing our worth and continue on destructive paths. We are committing to have our spiritual and physical well-being challenged by the sin of this world. Yet, here is Jesus commanding us to provide love, hospitality, generosity, forgiveness, and inclusiveness to all whom we encounter; especially the “least of these” among us. And if we aren’t in with “the least of these”, then we are missing Jesus. But the reality is that we are all in the role of being “the least of these” at points in our lives. We will all be in situations that need the service of others to help us endure our pain and struggles. 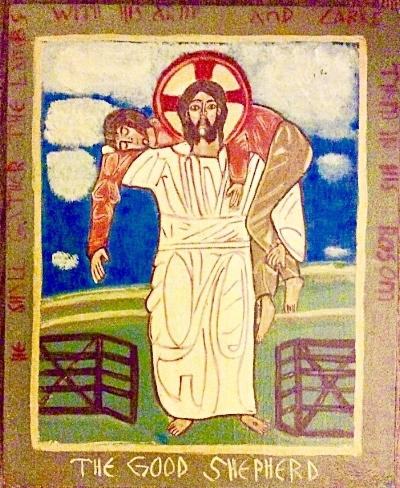 This “yes” to Jesus, although it is hard and messy, allows us to serve as vessels for the Holy Trinity to facilitate wholeness, healing, and community that enables us to endure the brokenness in life. What makes life in ministry to be sustainable is complete reliance on our Holy Trinity and our trust in doing God’s work rather than our own. Our call is to love others and this requires consistent forgiveness, responsible generosity, and appropriate boundaries. And most importantly, Grace for ourselves and others, so that others may receive a glimpse of Christ’s Light. However, our intentions and behaviors of generosity and righteousness need to be carefully and continually examined. Scripture teaches of punishment and judgement but if our motivation is derived from fear of Christ’s judgement and eternal damnation, our efforts are going to continually fail and fall short of what God is needing from us. It is a complicated and continual discernment of where are we allowing Grace in our lives and actions. Where we are called to serve Christ through serving others. And where we are called to say “yes” to the Holy Trinity. Saying “yes” can be a ministry such as serving at food outreaches like St. Paul’s CO-OP or the Open Door Dinner, being Eucharistic Ministers to those who are not able to come to church, attending the Detention Center Vigils and praying for or visiting the incarcerated, and All Soul’s Call to the development of the affordable senior housing ministry. But it can also be simple like being generous with water and protein bars or meals to those living on the streets. Or calling and checking in on someone who is enduring an illness or grief. Greeting strangers by looking them in the eye with a friendly smile; a simple act to acknowledge their holiness. Today’s feast of Christ the King reminds us that our allegiance is to be with our Heavenly authority and not to the sins and human ego of this world. As we approach Advent and the season of Christ’s coming, where are you being called to say “yes” and serve God’s Kingdom as a vessel for Christ? Does it include radical compassion, generosity, and hospitality as Jesus instructed?